Transportblog did a good job of fisking the recent comments Prime Minister John Key’s criticism on Auckland’s transport plans. In an interview with Paul Henry, the Prime Minister made a number of factual errors about Auckland’s transport issues that demonstrate he is either being poorly advised by officials, or is deliberately misinforming the general public. This prompted the CBT to write a letter outlining the inaccuracies in the Prime Minister’s comments. Consistent with most communications we have with central Government, we have yet to receive a reply or an acknowledgement. To start with, the resident population of the CBD is about 3 or 4 percent, not 15 percent. It is generally accepted that about 15 percent of Aucklanders are employed in the CBD, so I think you or your officials are perhaps confused by this. Next, I need to make you aware that rail to the airport is not the top priority in Auckland’s Regional Land Transport Plan 2015 – 2025. There is currently no designation for rail to the airport in place. Rail to the airport does not feature until decades two and three of the plan – hardly a good basis for you to be claiming it is the top priority for Auckland. 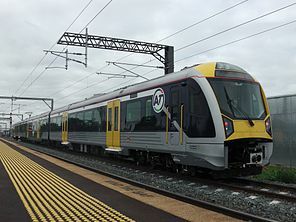 It is the City Rail Link that is the top priority for Auckland, which has the support of a majority of Aucklanders and groups such as the Employers and Manufacturers Association. The CRL will create at least 50 percent more capacity across the entire rail network and enable faster, more frequent rail trips not just to the CBD, but all over the Auckland region. Patronage is likely to hit 20m passengers a year by 2017 , two years earlier than the arbitrary target of 2020 which has been set by you. (I say arbitrary, because no prerequisite traffic targets are set for RoNS projects such as the Puhoi – Warkworth toll road). Without the City Rail Link, the full benefit of Auckland’s brand new electric fleet cannot be realised, as Britomart will soon reach capacity. In the interview, you also claimed that Auckland Council will be spending half a billion less on transport in the next three years, even if a levy is implemented. By now, you should be aware via Radio New Zealand that this is incorrect. I have also obtained confirmation from the Auckland Council that their capital expenditure on transport over the next three years will in fact be roughly the same as the previous three years. In summary, Prime Minister, very little of your official’s advice stands up to scrutiny. I am left wondering why you think unfounded criticism of the Auckland Council’s transport plans and the transport levy is helpful? You don’t offer any alternative plans or funding mechanisms. It would be more constructive if your officials discussed any concerns with their more knowledgeable counterparts at the Auckland Council and Auckland Transport, instead of giving you demonstrably false information. 1. Transport is about moving people and freight efficiently. 2. Auckland has a peak time capacity constraint, which providing more lanes for single occupant cars won’t address. 3. Investment in mass rapid transit is required. This also benefits road users who don’t have a choice to use public transport. 4. It is valid for petrol excise tax revenues to be spent on any project that reduces traffic congestion on roads. 5. An evidence-based cost benefit analysis should be used with all transport projects, using a methodology that places value on reducing reliance fossil fuels. Prime Minister, I think you would benefit from some accurate advice on Auckland’s transport issues. Accordingly, we would welcome the opportunity to meet with you at your soonest convenience.